Today I have a quick little video for you about one of my newest beauty tools, a heated eyelash curler. One of my good friends gave it to me for my birthday and it was a fun surprise. 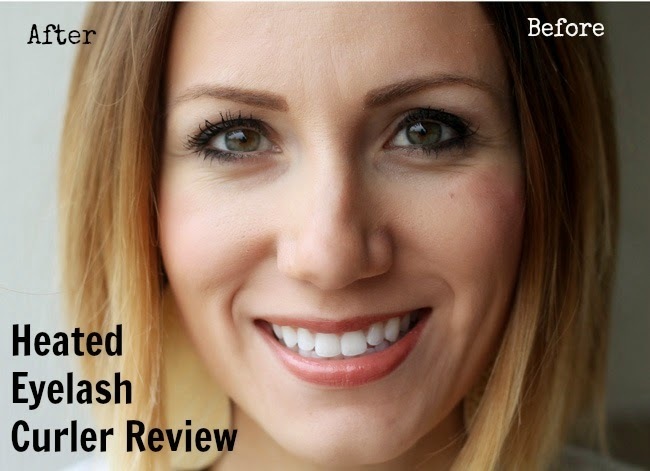 It is surprisingly easy to use and makes a big difference when I'm wearing my favorite Covergirl Lashblast mascara. In these before and after photos, I have on 2-3 coats of mascara so you can really see the difference. I haven't tried this curler with my 3D Fiber lashes, but I don't wear those every day. This curler with my daily mascara is a good everyday solution for my thin and short eyelashes. I get asked for beauty tutorials all the time and let me tell you, I would love to more of them! Unfortunately I keep waiting for time to do a better job at them and well, time is not available. So I'm going to try and do them anyway, and you'll have to try not to compare me to anyone more professional. It is hard to see the results at the end of the video, but you get the idea about how to use it, and then I've shown the results in the before/after photos today. All in all, I don't think this is an absolute must, but it's a fun tool to have. I think it would make a great Christmas gift for your beauty tool loving friends (or put it on your own list)! You can find this tool here or at your local Sephora. Have you tried a heated eyelash curler? What are your favorite eyelash tricks? I used to have one and loved it ! It was suggested by a make-up artist saying that it was less damaging than a regular curler. Also, it lasts one day when done on eyelashes with mascara, and one hour if not wearing mascara. Cool, thank you - buying one!